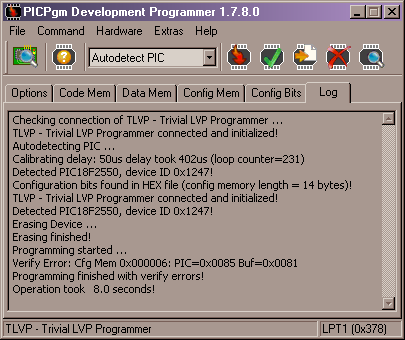 Has same purpose like serial port programmer. You have to use it to get PIC bootloader before you use USB HID programmer or you may use it to put any other FW into your PIC. Programmer uses In-Circuit Serial Programming (ICSP) interface described in PIC18F2455 / 2550 / 4455 / 4550 Data sheet. I don’t know if USB to LPT converter will work. Scheme contains just 1 resistor. This parallel port programmer needs external power +5V. But it is easy to overcome this problem by getting needed power from USB port (as shown on bottom right corner of scheme}. 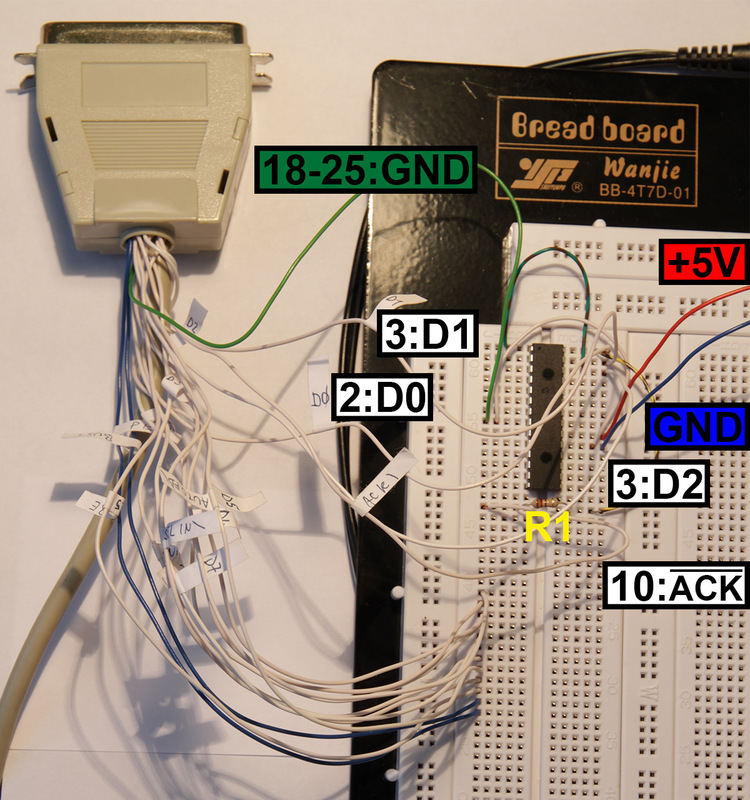 See USB pinout on USB programmer web page. There are few additional components used (two capacitors C1 and C2), but nothing critical will happen if you omit them both. To simplify scheme you can omit R1 and LED1 which role is to signalize that +5V is available on output. C3 is not critical, too. But I do not recommend removing of capacitors C1 and C2. I have used LPT cable 25 pin D sub to 36 pin centronics connector. I have decided to not to cut centronics connector from cable, because this is my only cable of this type (and today it does not make sense to buy next one). But I have soldered wires on all signals of centronics conector, so the cable can be still used. Every wire has its own signal name label for fast & easy use. I have decided again for PICpgm. 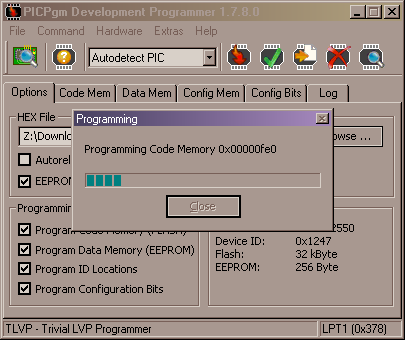 It is really mature and universal programming SW (I have also used in parallel PIC programmer). And it is for free, too. No additional drivers are needed to run programming SW.
All needed you could find packed in 1 archive at the bottom of this article. 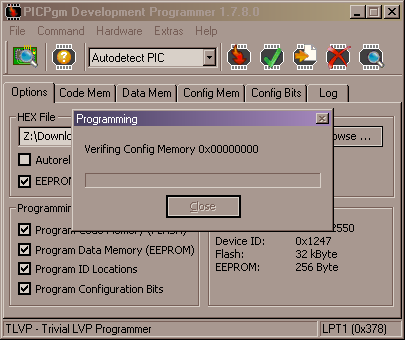 Connect your parallel PIC programmer to PC / NB. Power up parallel PIC programmer with +5V (USB power source or adapter with stabilized DC). 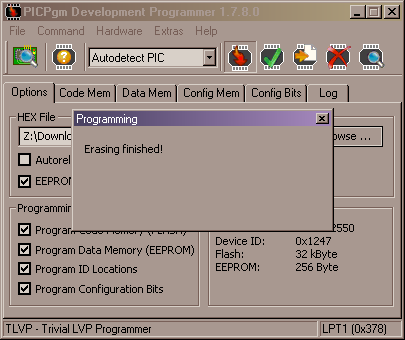 Start PICpgm (I have used v. 1.7.8.0). The only difference should be in Port configuration - mine parallel port is named LPT1. Here chose parallel port name your parallel port has. You are limited to choose LPT1 to LPT4. If your parallel port number has higher number you have to change it in your windows device manager in your parallel port device driver. Be patient, it takes some time till PicPgm reads information after you click OK in previous step. 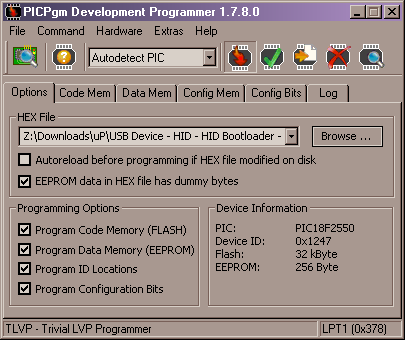 I have used HEX file of USB bootloader for PIC18F2550, see archive file for download in USB programmer. 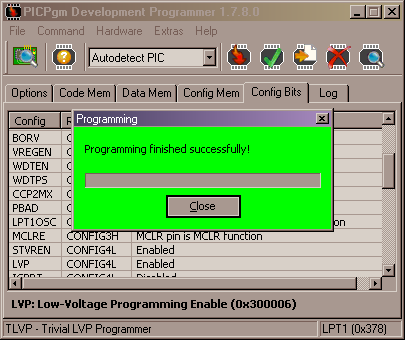 Now rest of the work does PICpgm automatically. 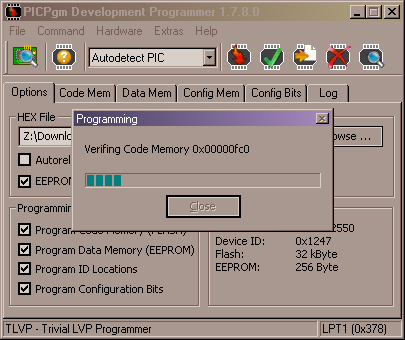 That is just few bytes to program, so this step goes fast. Even verification fails, programming was successful, as is also written on PICpgm web pages: If you do not need RB5 as I/O pin and RB5 is held on GND level you can ignore this verify error. It will not cause any problems. In my case there was problem with Normal Delay factor and Slow Delay factor, but I found optimal value in the middle of range. 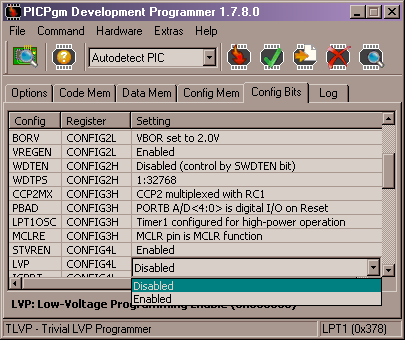 You have to go to Config Bits tab of PICpgm and change the configuration of LVP bit manually from Disabled to Enabled, when there is Disabled value. 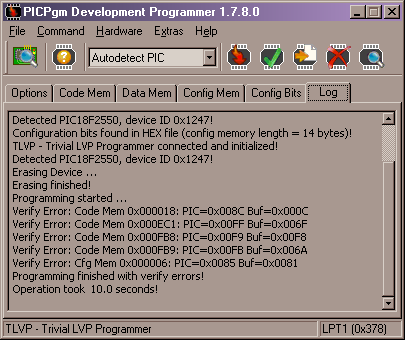 You have to do this every time you load HEX file into PICpgm. This "Success dialog" will automatically disappear after few seconds. 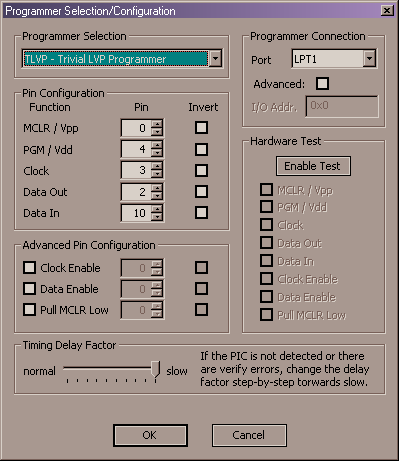 LPT programmer schematics in PDF. 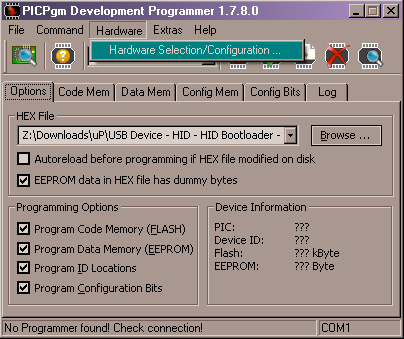 You can start with programming USB HID bootloader into PIC - see section USB bootloader. This article just shows what worked for me, it does not mean there is not another way to achieve same result. You can find many other programming SWs. I like PICpgm. 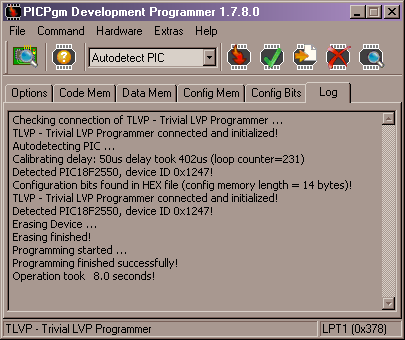 I was also successful with ElCheapo configuration (using same configuration like for TLVP seems it does same work). 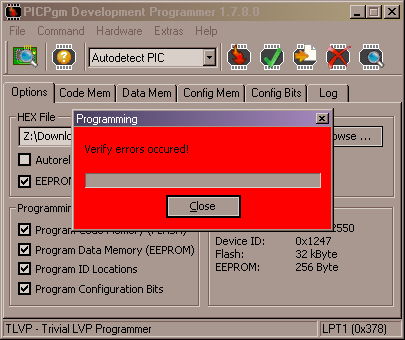 If you get verification errors, nothing is lost, try to check configuration changes described in step 16. Programmer has to work with PIC18F2455 which has 24kB FLASH comparing to PIC18F2550’s 32kB FLASH. So this is Simple serial port programmer (JDM programmer) for PIC18F2550 and PIC18F2455. Don’t forget, everything you do is at your own risk. You have to know what you are doing. I am not responsible for any damages caused by using any information from these web pages. If you want to work with PICs professionally, see some commercial products with debugging capability.